These talented musicians will take you on a beautiful trip through the magic sounds from Brazil. 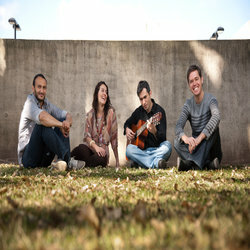 Coisa Linda delivers a warm and sophisticated interpretation of some of Brazil’s musical masterpieces and will impress you with their tasteful original songs. Brazilian singer, completed a Bachelor of Music and a Graduate Diploma in Music at the Queensland Conservatorium. With her accent from Rio de Janeiro, Lucia displays effortless phrasing, strong rhythmic feel and is a talented storyteller. Despite being the only Australian in the band, Wade still grooves like a carioca! He studied a Bachelor of Music in Jazz piano at the Queensland Conservatorium and brings sensitivity and taste to the songs. Born in Sao Paulo, Brazil, Mauricio Hosi graduated as a Bachelor of Music, majoring in Guitar and adds harmonic sophistication to the group. Claudio is a vibrant Brazilian percussionist with a fantastic rhythmic talent. He masters all the Brazilian grooves, with a contagious and intoxicating energy that makes people feel like dancing! Para de Bobeira is a Brazilian funk song with a contagious groove, a catchy riff and will put you in a happy mood. The song is an invitation to dance (and even if you don't understand the lyrics in Portuguese, that's what you'll feel like doing).